These days, I'm working on a project to locate and research all of Montana's extant railroad depots, part of an upcoming book for the Montana Historical Society. So you'll be seeing a lot of railroad-stration photos here ... which is appropriate, given their importance to the state's history, and their ephemeral, vanishing nature. 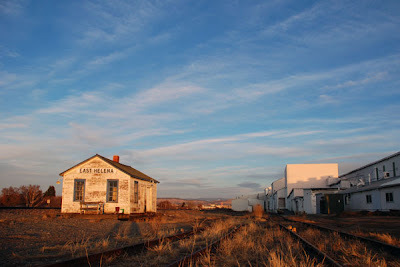 This is an early-evening shot of the little Northern Pacific railway depot in East Helena. The building was moved there in 1930, after the older East Helena station was destroyed in a fire. The depot has been unused for quite a while, now, and last year the railroad announced plans to demolish it ... but happily, local preservationists are planning to move it to a safe spot about a half-mile away. I grew up in East Helena during the 1950s and 1960s. For many years Boyd Bomar manned this little depot. I don't recall anyone ever boarding or leaving a passenger train; but there was a good deal of freight and ore traffic. Much of the rail traffic was, of course, related to the smelter. Nice to hear it's going to be saved. Many thanks for the reminiscence! I really like that little building, and it's a rare survivor .... almost one of a kind. I keep driving by there hoping to see the building finally being moved -- it was supposed to happen last year -- but nothing yet.